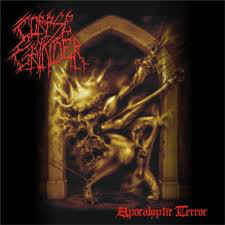 The veteran Brazilian Death Metal band, Corpse Grinder has just released a new album, Apocalyptic Terror. Their fourth album was recorded and mixed at Studio Pro Mix (Alfenas / MG). Old School Death Metal lovers can check this devastating album made of the purest and ancient brasilian Death Metal! Completing 20 years of fight, respect and integrity inside of brazilian underground, the band carries on keeping the allegiance and essence of its music. Against fashions and trends, Corpse Grinder brings its old Death Metal for true delight of the Death Metalhead maniacs for old and immortal school of the style. This is fast blistering Death reminescent of KRISIUN, early CANNIBAL CORPSE, INCANTATION, BENEDICTION with a monstruous guttural voice! Categories: CD-Distribution, DISTRIBUTION, DISTRO STORE. Tags: Death Metal, Kill Again Records.